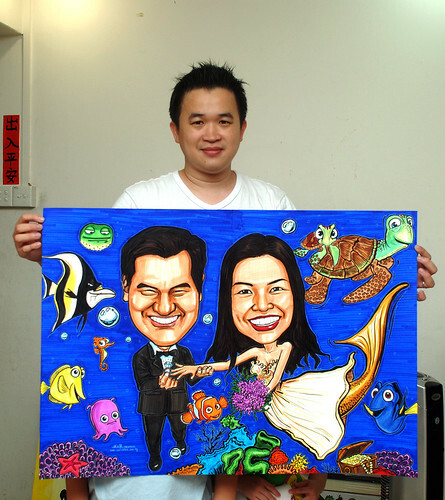 I did a job for this client from Hong Kong in 2007. 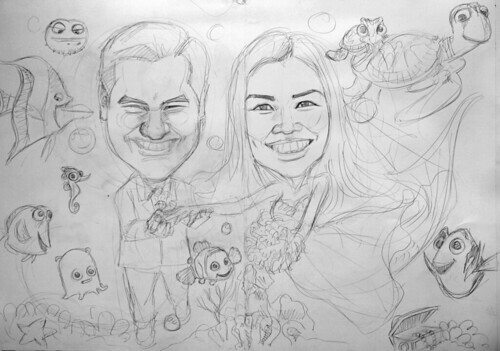 This time, she requested (from my Facebook) for a wedding caricature as a gift for her niece. She's not really sure of what theme she wanted initially. "....As for theme, they are both dog lovers and they call each other nick names ‘Fish.’ I am not sure would that be useful...."
The initial size required was A0, but was changed to A1 size. Thank goodness too. 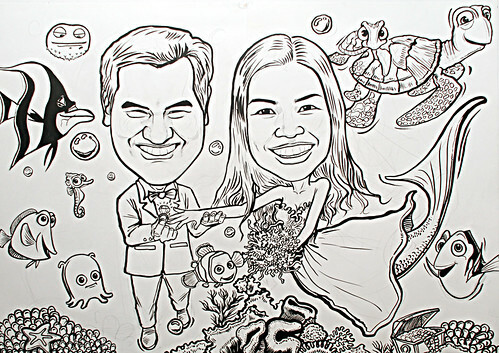 A1 (59.4cm x 84cm) was already very huge for couple caricatures - biggest size I have done so far for couple. 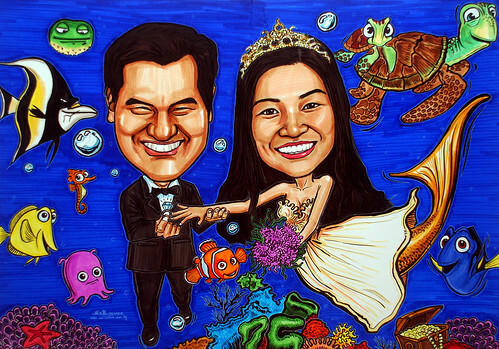 I proposed a underwater wedding theme for them, with her being the mermaid bride. Along this line, but different design. I joined 2 A2 size marker paper on 1 card, using different elements like fish, hair, coral, flower etc to hide the joining part, just like the job for Philip Morris. I added in those fish from the movie "Finding Nemo" to spice up the drawing. Done, after hours of drawing. Unfortunately, the client not very happy with it. "Honestly it's better but still something is wrong..."
It's really a "phew phew phew!" Amend till I don't know what else to amend. At least now she's a happy client. This A1 size drawing was rolled up in a huge postage tube, and shipped to HongKong. Hopefully no damage to it....... and most importantly, this couple will like it.